Choreographer and performer Molissa Fenley has created more than 75 dance works in her ongoing career. Her work has been presented throughout the United States, South America, Europe, Australia, India, Indonesia, Japan, Korea, Singapore, Taiwan and Hong Kong. Born in Las Vegas, Nevada in 1954, she earned her BA in 1975 at Mills College in Oakland, California, and in 1977 she formed the Molissa Fenley Company in New York City. Molissa Fenley performing 94 Feathers, 2010. Photo © Julie Lemberger. Fenley has collaborated with many visual artists throughout her career, including Kiki Smith, Richard Long, Francesco Clemente, Merrill Wagner, Keith Haring, and Roy Fowler; and she has also incorporated the musical compositions of Philip Glass, Laurie Anderson and John Cage. Her work has been commissioned by the American Dance Festival, the Brooklyn Academy of Music’s Next Wave Festival, the Joyce Theater, DIA Art Foundation, Jacob’s Pillow, Lincoln Center, the New National Theater of Tokyo, the National Institute of Performing Arts in Seoul, The Kitchen, Dance Theater Workshop and many others. She is a Guggenheim Fellow, a Fellow of the American Academy in Rome and a Master Artist of the Atlantic Center of the Arts. Recent awards include the NEA American Masterpieces Initiative for the reconstruction of Regions. Fenley received a New York Dance and Performance “Bessie” Award for Choreography for Cenotaph (1985) and State of Darkness (1988). She is Professor of Dance at Mills College, in residence each spring semester, and often teaches choreography at the Experimental Theater Wing of New York University and repertory workshops at other universities, most recently at Bennington College. Recent works include The Vessel Stories, with music by Philip Glass, Credo in US, with music by John Cage and Cross Bridge: a collaboration with Holley Farmer, John Jesurun, David Moodey and Rosemary Quinn. I sat down with Molissa at her loft in Tribeca, New York on October 8th. I’d like to start by responding to your recent performance for New York Live Arts. Program B began with a re-staging of Witches’ Float, the collaboration you did with sculptures by Kiki Smith, which originally debuted in 1993. There was a reddish-brown body paint on the torso, arms, neck and face of the dancer. The contrast between the texture of the skin of the dancer and the sculptures was really interesting—the sculptures had a desaturated quality or lack of color. As the dancer sweated the body paint texture changed and it melted off, it seemed to be an expression of bleeding. I’m really interested to hear about your thinking and decision making that went into that piece. Holley Farmer in Fenley’s Witches’ Float, 2013, New York Live Arts. Photo by Ian Douglas. Yeah, that’s what we were thinking! The idea of that piece was really interesting. Kiki and I were talking about how everyone’s outer skin is of a particular color, whatever their race or heritage, but if you were to flay that, the inside of everybody is bright red. It was a means of getting to an idea of the “every body.” This shamanic figure could really be anybody—male, female, and the idea of the costume suggests that too. The dancer is bare-breasted but covered in body paint, which is kind of like a costume in and of itself. And on the bottom she was wearing pants that look both masculine and feminine, the top is feminine and the bottom is masculine—the pants are a kind of dhoti, designed by Gabriel Berry. It’s like a human form of both female and male being presented. And it’s of any race, because it’s flayed, a very raw idea. Where does the ‘witch’ element come into that? Kiki and I had been discussing the women (witches) tried during the Salem Witch Trials. Women were tied to chairs and thrown into the river—if they floated they were a witch, and if they sank they were not a witch, but they were dead. Well of course everyone dies! If you notice in the title, ‘witches’ is possessive, so it’s like the float of the witch—well now, what would that be? We started thinking about a kind of shamanic transformation that might take place during a possession, being immersed in something in a very deep way. The practitioner starts underneath the floating witch, whom is a sort of overseer; this is where it all begins. And then once some kind of transference has taken place, the practitioner travels into the middle of the space to where two halves of a sculpture lay side by side—one upside up, the other upside down. It’s as if two halves of the same person, but it also a kind of mold. And in essence, it is: it’s the mold that the floater came out of. The dancer then continues to stand in front of the sculpture as a standing witness, which is actually a plaster cast of me. Kiki and I made the original work in ’93. It has a slight angle forward, right? Yes, she’s really staring in and watching. It has an aggressive feeling to it. There’s a confrontational feeling to it, yeah. There’s sort of like a “you’re being watched” feeling, and then at one point the practitioner comes very close and puts her arm around the witness, leans in and listens to what the witness is “saying”, a very intense moment, I love that moment! I loved the way it was lit, the viewer’s frame of reference was so molded around it, shaping the way we see the sculptures and the dancer. My lighting designer David Moodey has been working with me since 1986. He has a really uncannily completely clear idea of how to light my work. And I explained that this dance is really in three parts—around the floater zone, then it’s around the cocoon zone, and then it’s around the witness. The witness is ultimately sort of ‘all-seeing,’ perhaps, and then at the end of the dance the floater sculpture lowers to just hovering above the stage floor. I’m not sure what the significance of that is for me but certainly the practitioner takes on the authority of the space. There’s nothing over her anymore. I’m really interested in the way you’re describing the dancer as a practitioner. Can you explain your choice of language? For that piece in particular, when you think of shamanic rites, you think of a subject that goes through the practice. And so the practitioner is the person who is undergoing this journey, this rite of passage, or this rite of entrance into another world. So practitioner makes sense to me in terms of that piece. I wouldn’t use that term for the other dances. Witches’ Float, 1993, Molissa Fenley. Music by Alvin Lucier, “Music on a Long Thin Wire.” Sculpture by Kiki Smith. Commissioned by the Krannert Art Center, Urbana-Champaign, Illinois. It’s interesting, I made that piece right after I’d been in India for two weeks and in India everyone’s going around like this—and I’m shaking my head in the way that the practitioner does in Witches’ Float. Everyone’s doing it all the time! And if you ask someone a question, it’s just like—well, are you saying yes or no, or—what are you saying! I can’t understand what it is exactly, but it’s an Indian trait that I noticed when I was there and so I wanted to use that because I found it to be so reverberate. And the music is very beautiful, by Alvin Lucier, “Music On a Long Thin Wire,” and it’s built on the idea of vibration. And so this idea of a vibration inside the body really manifesting in the neck and head, I thought was just fascinating. And that whole thing of the stirring hands, again very kind of spell-like. Not necessarily casting a spell because I don’t think of the dancer as a ‘witch’ as such, but she is inside of some other kind of worldly presence or other worldly state of being. And then her movements—you called them jagged, that’s right. There are a lot of very staccato actions, meaning very abrupt and percussive. There are two very different actions that are going on, two different types of movements. The legato versus a very tight gesture. It seems to come out of nowhere, it breaks the space in this really gestural way even though it doesn’t feel gestural. It’s sort of severe, and very intense. A lot of that is taken from my idea of a kind of Hindu dance. I’ve also really been interested in Asian art for a very long time, and in Indian art the dancers are always like “this,” they call it tribanga, it’s three bends—there’s a bend at the hip, a bend at the torso and a bend at the neck, so I really like that idea that the body is seen almost like a river—as a serpentine form. In Hindu dance the positions of the hands are called ‘mudras.’ If you think of Hawaiian dance, the hands are saying some kind of communicative message or telling a story and I wanted to really abstract that but to have an other-worldly thing going on in the hands and the upper body that is eluding to something coming from a whole other ethnography. In Found Object which debuted at New York Live Arts, you were responding to other artists’ instructions while also responding to dance notes of your own as a kind of instruction? Arabesque out to the right and tilt back. Arm twist, lunge forward on the right and elbow forearm twisting. This is the language I use to write down my phrases. That’s how I memorize them—I sit on the subway and read, almost like memorizing lines. And once the piece is performed a video is made, and that’s how the piece is documented, between the notes and the video. For those particular phrases that formed the source of Cross Bridge there was no video made to actually show exactly what the language meant. The phrases were written around the year 2000, and I was looking at them in 2012, so it’s twelve years later and I have no idea exactly what it means. I found that very interesting because it was like finding some instructions that I knew had been made by me at some point but their meaning was not clear anymore. I made a new translation interpreting what the language described to me. I thought that was really interesting following instructions, and so enjoying that, I decided that for this new piece I would ask for instructions from others and I wanted to work with writers for this found object. I wrote to each writer, Joy Harjo, John Guare and Rudy Wurlitzer and asked if they would send instructions that my working on or solving would come up to about five minutes of stage time. Also in asking for instructions, I made the stipulation to myself that whatever they give me I accept, so that it really becomes in essence a found object. If you find these instructions buried somewhere and just use them, then you don’t really have a judgment about them. I really like that. I like the idea of the piece’s title. That it’s a found object, but it’s not an object at all. It’s abstract instructions that can be interpreted and even though they’re specific, it’s still completely up to you how you do it—that’s sort of the opposite of a real object. Right. And in John Guare’s found object instruction, there were the two instructions—one about drying flowers, and one about your rights as a POW under the Geneva Convention. In part of the language of drying flowers, when he says what you need—you need scissors, you need string, you need a ruler, you need newspaper, and you need two small vases. I was memorizing my lines one day and I just thought it would be hilarious if all of a sudden two GIGANTIC vases arrive on stage! So I asked painter Roy Fowler to paint a backdrop of some vases and he almost immediately got into that idea of the Rubin vases which is the trompe l’oeil thing–if you look at it one way, it’s a profile, if you look at it another way, it’s a vase. So there are two of them, one is Rosemary’s profile, the actress I was working with, and one is mine. And then at the end, the last statement is “place arrangements in small vases, display or give as a gift,” and we place ourselves in front of the canvases. I love that! Found Object, 2013. Photo by Ian Douglas, Courtesy New York Live Arts. In the fourth part—those two things, flowers and POWs are objects, they’re things to be acted upon, they don’t have their own wills, really. So that’s sort of another interesting interpretation of it. Yeah. And in the very beginning of the dance were the hand props made by Jene Highstein who made them for me for a piece in 2010, called Pieces of Land, which was one of five of the Prop Dances, and the idea was that when you look down from an airplane, and see the topography of the land – there’s a square there of farmland, there’s a diamond over here of forest, you see things in geometric forms. That was the idea—that these were pieces of land that we’re carrying on our bodies. And they’ve just been sitting in my closet, so they were another found object for me. I just found them in my closet and Jene had just recently died of an illness and so it was a nice remembrance of him to wear them. I loved Energizer. I loved the repetition in the piece, the music was fabulous, and I read that it was recovered from your archive and the sound recording had to be baked in the oven in order to recover the quality. Can you talk a little about that? Yes, the tape is one of those big reel-to-reels, and when Maggi Payne, who is a professor out at Mills—she’s a wonderful conservator of music as well as a music professor and composer—she put it on to listen to it and there was nothing there. The music was composed in 1980 and this is 2013, over the years what had happened was that the music cells embedded themselves inside the tape, into the inner workings of the tape, the cells get “lost.” It’s hard to explain but they are not apparent anymore, they’re not at the surface so you can’t record them anymore. She baked them at 110 degrees for twelve hours. The heat coaxes the cells of the music up to the surface of the tape so that you can re-record it. She did such an incredible job and the music sounds like it was made yesterday. That was the really fun thing about bringing a piece back like Energizer, choreographed in 1980, not danced since 1982, so 33 years old. And not having been even thought about for 31 years. That’s just like one of my pieces that’s just been sitting in the video can all these many years and so to bring it out I wanted to do a pure reconstruction of it—the costumes, the movement, the music, all but the lighting was new—the lighting was by David Moodey. The original lighting had been by Phil Standstrom. It was just amazing to do. I was wondering that—what is it like for you to see your work from when you were first beginning and now restaged? Well it’s just fascinating! And I wanted to do it so that it was a true translation, I didn’t monkey with it, make it so-called “better” or come at it with a more mature choreographic eye or anything. I thought that the mathematical construction of it was really interesting and there are these different variations of things—I mean, it’s a very dense piece. Very complex—there’s a lot of vocabulary in there that’s minutely different each time it’s danced and then phrases were cut up so that sometimes you get part of phrase A and ended it with phrase B and then sometimes you’d get one measure of phrase C on top of that. I mean, it was really complex! 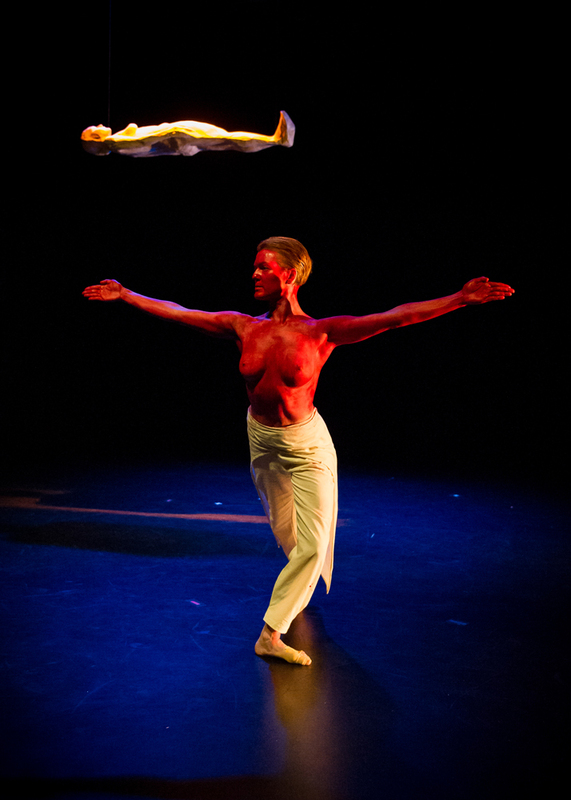 Members of Molissa Fenley and Company performing Energizer, reconstructed in October 2013 at New York Live Arts. Photo by Ian Douglas, Courtesy New York Live Arts. Really ambitious, just so packed. Yeah, and I was just 25. The layering—the movement and the energy, it kept unfolding and coming and coming, I really enjoyed it. The thing that was funny was that when it was made Anna Kisselgoff really loved it and gave it a big boom, but everybody else just derided it. Saying it was like marathon dance, and a flash in the pan, and all this stuff, it was just so confrontational. The new lighting was really interesting, the projection in the back had a landscape quality, almost twig-like but at the same time abstract, and it had a strange visual interference to it. It wasn’t a straight projection, it had sort of a weird pixelated feel to it. Yeah, that was on a scrim. And then the pattern on the floor was really interesting. We all worked on that dance really hard all summer. Peiling and Becky and I started working on it last March when I was at Mills. Peiling got her MFA at Mills in 2010 and she lives in Oakland, and Becky is at Stanford working on her doctorate in performance studies. And so we would get together once or twice a week and just pour over the video and put it on slo-mo and try to figure out what the steps were. Then I got back here in the summer and I started with Cassy and then Chris came in about halfway through the summer, and it’s just painstaking to reconstruct it. It was so much fun, it was so rewarding when we finally found a phrase and then we’d do it and then we’d look at the video one more time and correct ourselves and then figuring out who went where, it was just really great. Molissa Fenley in the original staging of Energizer in 1980. Photo © Paula Court, Courtesy Special Collections, F.W. Olin Library, Mills College. That’s what I was wondering, as a visual artist myself, wondering about the differences between that and what you do. How do you make work? What’s your working process? How do you self-edit? Well it’s really different for each piece. It’s hard to know exactly what the working process for that piece was because it was so many years ago. But I doubt it would be too much different from now. The way I work now and have for as long as I’ve been aware of how I’m working is that I start making phrases of movement, and they get written down. And they get memorized and uncannily enough I almost always work chronologically, it starts at the beginning and just goes. I rarely start with music, music comes often quite a bit later. I start with my own forms of rhythmic structuring. In Energizer, it’s just a real solid base of 4/4 all the way through. Dances made after that would be rhythmically all over the place, you know, a measure of 5, a measure of 7, like the piece I did in 1983 called Hemispheres with Anthony Davis was really polymetric, so that formatting changed. I’m pretty sure at that time, in 1980, I would have dancers come in probably maybe an hour or two after I’d been working by myself and then I’d teach them what I’d made, and then I would set it spatially. For Energizer I was really interested in a circle, and then within that there’s the square of the axis, so there’s this sort of pie thing going on—there’s the top axis, the horizontal axis, the vertical axis and then the diagonal axes, and there’s a sense that a rotational idea is going on, and then there’s also a big square around the whole thing, so there’s an outer perimeter square and then an inner circle. It gets cut up and re-seen over and over—a dancer will do something and then another dancer comes immediately and does the same pathway but then maybe has a different ending and goes off and does something else, and then that might be echoed by another dancer. So it’s very intricate, moment by moment. And then as I said, I work very intuitively. I’m sure that in Energizer, once I would get something done—and we didn’t have video back then! —you just did stuff, and you either remembered it or you didn’t. Of course the piece was video taped, because that’s how I was able to reconstruct it. The piece that was playing out in the lobby (at New York Live Arts on October 2nd-5th) was the original, that’s the tape that we reconstructed from, so you could see it was really fuzzy, but we managed. As far as daily doings or daily remembering of what we’ve made, it’s all just memorization. It’s writing it down and memorizing, and then the dancers will do the same thing, come in day after day, and you just drill over and over and over and over until it gets completely intact and completely known. What is it like to work with other dancers? Do you see their bodies and their energies as yours? How do you form other people to make the spatial expressions that you want? Well I work with people who are really well trained; they have a lot of physical ability. I don’t want them to look exactly like me necessarily, I don’t teach my dancers class every day or something like that. People come to me already warmed up, and either they’re from a ballet background or a Cunningham background—whatever their dance background is, what I take into consideration is the means of how they will translate. And everybody tries very hard to do exactly what I’m doing—I’ll put my hands like that and they do it. But it looks different on everybody because it’s a different body. I really love that. I’m not interested in having everyone look the same, I’m interested in there being a vocabulary that’s translated from person to person in their own idiosyncratic way. In terms of a commonality, we’re all working towards this very particular vocabulary and how to present it in its most clear form from person to person. What was your first memory of wanting to move through space to express yourself? Well when I was a little girl I used to make dances for my dog and me. I had a dog named Shadow and I used to dance around the living room with Shadow all the time. I grew up in Nigeria and was always outside, and I saw a lot of Nigerian dance. I just felt really at home in moving my body. The Energizer piece seemed to really express some of that rawness, that sort of grounded excitement about learning how to work as a dancer. Is that right? Yes, that’s exactly right. There’s a total exhilaration there. And also you have to understand, I graduated from Mills College in 1975. I was 20, I got on a bus and came here to New York, and my first major piece was in ’77, and then in ’79 The Kitchen commissioned a work. So it was very quick, I just jumped in and started being a choreographer right away. I came from a training that was modern dance—we studied Graham technique, Cunningham technique, and Limon technique. I had one semester of ballet, from a woman named Paulette Sears, who was one of the MFA graduate students. I’m not from a ballet background whatsoever. The movement is coming from my interest in the upper body being a very translational mechanism of communication. I guess you could say it started off referencing Egyptian hieroglyphics that I then I twisted into three dimensions. I started forging this vocabulary on my own. Can you talk more about growing up in Nigeria and attending high school in Spain? What was that like and what made you decide to come back to the states to go to college? Well I went to high school in Spain because I wanted to go to an American college and the high schools in Nigeria were not accredited. All the American embassy kids—my Dad worked with USAID— kids from North and West Africa went to high schools in Spain at American air force bases. The first year I was there I was in Sevilla, which is in the south and the second year which was my senior year I was in Zaragosa in the north. On an air force base, which is so-called “American soil” in Spain, we would take weekend trips into the city. I saw a lot of flamenco dance, which I was very influenced by, and although I didn’t study it, I really loved the whole extension of the back and the hands behind the head. There’s a lot of that in my work, particularly in my early work. I really loved the extreme verticality with really flamboyant arms. You know when you’re a kid, you just grow up where you grow up, and you don’t really have an opinion about it. When I got older I realized how lucky I was to have grown up in Nigeria. We were in Ibadan, which is about 90 miles inland of Lagos when we first got there, and then later we moved to Lagos on the coast. Our house in Ibadan was right up next to the bush; my brother and I were always on the bush paths. It was a really magical life, and I think about that now, I just think I was so lucky to have had that kind of nature around me, that deep, dark rainforest. Deep and complex and thick rainforest, beautiful—it was absolutely beautiful. The earlier work that was restaged for the performance felt like that—it felt really grounded in real stuff, the landscape. The landscape, there’s also a lot of social dance, dancers coming together a lot in these circles. You’ve done a lot with props and projections and live feeds, and that’s all in addition to working with other creative people. What was the first inanimate object you put into one of your pieces and why did you decide to go in that direction? I guess the first one—well you saw in the lobby the video of the piece I made with Keith Haring, that was my first piece. That was 1979, I think. The first object though was by the artist Steve Keister for a piece called Boca Raton at The Kitchen for an event called Dance Day. The piece was a small sculpture attached to the ceiling, that was probably the first object. I didn’t relate to it, except that we were underneath it. He was a substitute for one of my sculpture classes at SVA, he’s really nice and an interesting artist. Yeah, I actually know him now; he’s a very good friend of Roy’s. But as far as an object that I dealt with—in 1983 there was a project called Hemispheres and it had a series of drawings by Francesco Clemente. The drawings came in packages of ten and when the audience came in they were handed a package of ten —there were four different sets, so the idea was that you got package A and your friend got B, then the next person got C, and D and so on. So the person sitting next to you if you came in as a pair would get another set. Francesco liked this idea of possible commerce; it was the idea of the set design being actually in your hand rather than on the stage. That was very interesting. Molissa performing a re-staging of Hemispheres in 2006. Photo © Paula Court, courtesy the artist. And an audience participation which doesn’t overshadow the performance. Yeah. So the drawings were there for that kind of intimate feel of looking at something that’s small. And actually I unfortunately don’t even have one package left. Somebody walked off with my last one. Francesco probably has a package somewhere. I read that you’re referred to as a “postmodern” dancer. What does that term mean as it relates to dance? It’s very interesting in the art world for that word; it becomes so open that it means everything, so it then has no meaning at all. Yeah, I think it’s the same in dance. Now it’s sort of like a catch-all, not sure what to call it—it’s not modern, it’s not ballet, those are two distinct forms. So then uh, what is it? What drew you to work with visual artists—in dealing with a static two-dimensional or three-dimensional work, paintings or sculptures, what attracted you to that in your work? Well I just I really love the idea of the stage space being a volume, I’m talking about the ‘true stage’ in the sense that the theater stage space is there and the audience is out here. Not site-specific work, rather thinking about the volume of the stage area itself as a thing to be filled—you can fill it with light, you can fill it with movement, you can fill it with sound. And I really like the idea of objects or other ideas coming in—like for instance the Richard Long setting for the circle of stones, of where the actual space itself is completely shifted. And that I as a choreographer then not only deal with whatever choreographic concepts I have going on in my own experiments in phrasing or movement vocabulary, to being placed inside this space that’s changed, it’s not empty space anymore. I love empty space, but I also really like the idea of being challenged by either responding or not responding or working in tandem with a thing, of having another flavor in the space. How that space is now different because of this thing that’s inside it. What I do I as a choreographer to make either a larger picture or a smaller picture. It moves me along choreographically, it’s a challenge, it’s like using a piece of music—it has a flavor, it has a sense of structure. It asks: do you use that structure, do you make something in parallel to that structure? It’s like that. I find it as a great soundboard that I can hit off of and get ideas from. Before I came over I was watching some clips of 94 Feathers, and I was wondering about the props used in that piece. It’s so beautifully integrated and the objects don’t seem to have any natural weight. I love that piece. 94 Feathers was part of the Prop Dances, which also had the Jene Highstein objects with feathered props made by Merrill Wagner. For the Prop Dances I asked five visual artists to give me something I could either carry or wear. And whatever they gave me, again, I said okay to. Merrill has a huge table in her living room with a big bowl with glass top, in the bowl are all these feathers of birds she’s had over the years—parakeets, turkeys, hawks—feathers she’s either found or they’re from pets. She was interested in using those feathers and she had these metal trays that she had found in a steel foundry near where she lives in Pennsylvania that had holes in them, they were some kind of leftovers. She put the feathers into the holes and made these beautiful forms, they were just extraordinary. I was dancing at that time with Cassie Mey and Katie McGreevy, two dancers that I’d worked with for quite a while and they’re not in the company anymore. ?They moved on in their lives—that’s the other thing, dancers come and go—Cassie worked with me for ten years, and Katie for two or three, so you know it’s a solid group—and we made these pieces. When 94 Feathers was made, it was probably my first instruction piece. Where I made a dance and wrote it down, I was at Mills teaching and they were here in New York. The premiere was going to be here in New York in March during Mills’ spring break. And so I sent them the language of the phrases and asked them to make up what they thought the language was. It was really wonderful. That was the first idea of the method of following instructions and I have just continued further along with that. When you’re co-choreographing with other dancers how is it different for you? Right, stay in the language. Right. So they both did and then I thought okay, as one more unifying thing, there were two phrases that I taught of mine that they could do at any time during their rendition of what they were doing. We set it, they dance their phrases, and they insert my phrase 1 somewhere, and then later on insert phrase 2. Then I wanted to add the instruction of where you could replace somebody, or might echo someone for a second. There’s a part where Peiling is standing like this, and I come up and put my hand under hers, I replace her hand and she goes off and I stay there for a second. I really enjoy this method of working, which started with 94 Feathers—to trust. These dancers are all so lovely and they all work so hard and they make really good decisions. They’re very responsible. I can trust the art in them is what I’m saying. I can trust that they will carry the art feeling—my art feeling through their bodies, and that they will make the right choreographic decisions. I found that really interesting to allow that, to have another way of working. Do you plan on continuing to work with other artists in different mediums in the future? So what’s next for you? I’m going on a really nice residency at the Bogliasco Center in Genoa. I’ll be there from November 18th through December 20th. As a sort of clearing zone, I always find when I’m starting to make a new work I have no idea what it will be, but I know that I will almost always start with a vocabulary. One big source of vocabulary for me is Greek and Roman sculpture of the body. I’ll get a bunch of books and mimic whatever the sculptures are doing, and I’ll find that suddenly I’ve got some phrases—that’s always been a big source material. Molissa and Company rehearsing at Topaz Arts for their Jacob’s Pillow performance in 2012. Photo by Alyssa Wilmot, Courtesy the artist. How long does it typically take you to start something, finish something, work with it, or is just all completely different from piece to piece? It’s different. For instance I was at the American Academy in Rome in 2008 for six months and I made a pretty major work there called Cosmati Variations. It premiered there in June. I made four parts there but only performed three, towards the end of July I made another part. I worked with Italian dancers, I had an audition and people came in. So it varies. I know that in Bogliasco being there a month I will not necessarily come back with a completed pice but certainly with material. I think we cooked it! Published in Figure/Ground December 6th, 2013. Robert Kelly writes to Ashley Garrett's "Melding Madrigal"